Yavana Rani (, , lit. Greek Queen) is a Tamil language historical novel written by Sandilyan. The story is based on ancient Tamil poetry. It is a love story set around 2000 years ago, focusing on the Commander-in-chief of the Chola Army. The story Read More.. Description Yavana Rani (, , lit. Greek Queen) is a Tamil language historical novel written by Sandilyan. The story is based on ancient Tamil poetry. It is a love story set around 2000 years ago, focusing on the Commander-in-chief of the Chola Army. The story takes place during the period of Karikalan, one of the greatest kings of the Early Cholas. Yavana Rani (, , lit. Greek Queen) is a Tamil language historical novel written by Sandilyan. The story is based on ancient Tamil poetry. It is a love story set around 2000 years ago, focusing on the Commander-in-chief of the Chola Army. The story takes place during the period of Karikalan, one of the greatest kings of the Early Cholas. No reviews available for #YavanaRani, Do you know Yavana Rani?, Please add your review and spread the good things. 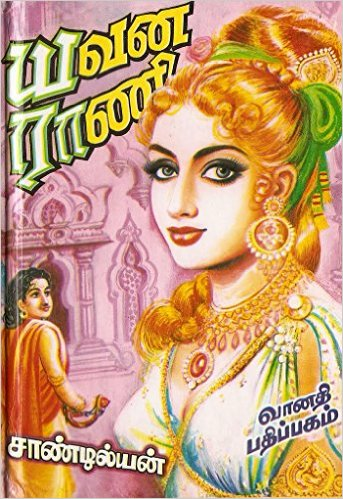 "Yavana Rani" is a Tamil historical novel written by Sandilyan. One of the best book I ever read. In English it is called as "Greek Queen". It is a love story set around 2000 years ago, focusing on the Commander-in-chief of the Chola Army. The story takes place during the period of Karikalan, one of the greatest kings of the Early Cholas. I love the roles of both YavanaRani and Poovazhagi. Heart touching story.Whoever is interested in reading novels should read it.